Considered to be the most beautiful country in the world, South Africa is a “must see” destination. And what better way to experience the landscape and culture than through the sport of rowing? 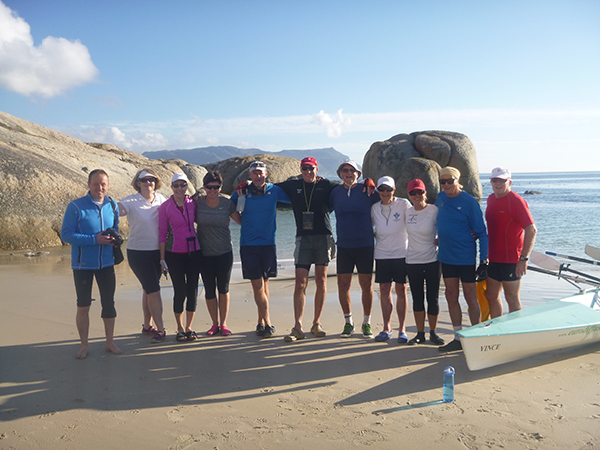 The South Africa Western Cape trip showcases amazing rowing in a one week adventure. 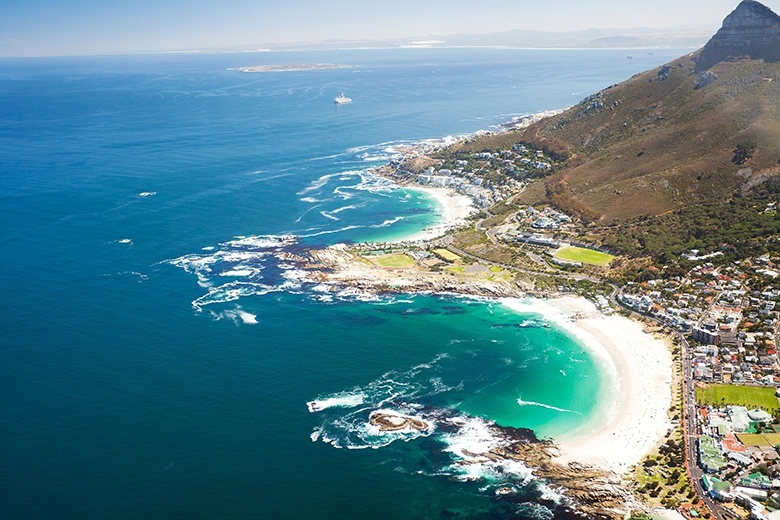 The Western Cape is most famous for the city of Cape Town and for wine. 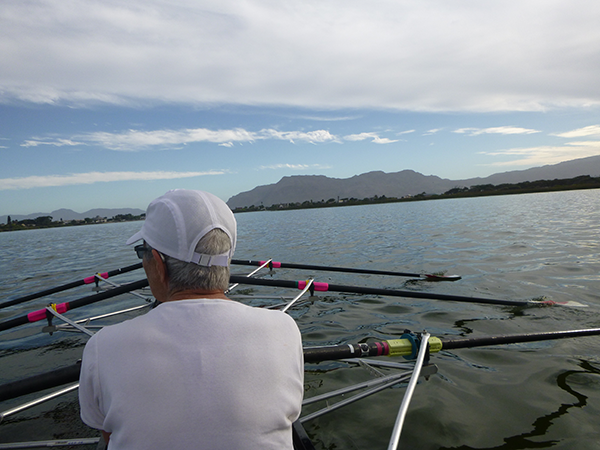 The trip starts with lots of Cape Town rowing. There is so much to see and do in this beautiful and fascinating country that we recommend that you use the rowing trip as your springboard to further adventures! We row with the back drop of mountains, hills and vast plains, plus one of the most beautiful cities in the world. Penguins will entertain us on False Bay; we will stop rowing to watch bright birds weaving nests that hang above the water; after a row and a swim at a beautiful reservoir we will have a wine tasting lunch under the shade of a spreading tree; and we will explore two very different rivers, the Klein and Breede, at the eastern part of this province. This is rowing travel at its best. Diverse groups of people have created a vibrant culture. You will not forget the beautiful smiles. They are like the sunshine: warm, constant and everywhere. Our South African rowing guides and hosts will share insights into this fascinating country, with its complex history. Experts will introduce us to history and wildlife. The food is spectacular, combing African, Malay, Dutch and English influences, with an emphasis on local production and the freshest ingredients. Of course the wine is well known, but craft beers and fruit beverages round out the choices. While rowing is the draw, there is so much to explore and enjoy in the beautiful Western Cape. Note that some of the rivers rowed are tidal in nature, which will determine the exact time of the rows. Wind conditions will also be an important consideration – safety is a priority. Thus, on some days, the actual program may vary from this description. We recommended that you book a few extra days in Cape Town in advance of the trip start. It is a magnificent city with much to see and do. Beginning on Day 2 of this trip, the focus with be on rowing, with relatively little time to sightsee in the “Mother City”. Arrival in Cape Town. Depending on arrival time, enjoy a sightseeing walking tour of the downtown and Company Gardens plus time to relax. We will discuss the plans for the next week over a wonderful welcome dinner. Cape Town rowing begins. Our first row is early morning with Cape Coastal at Simons Town. We will row on False Bay, but the wind and water conditions will determine exactly where we go. 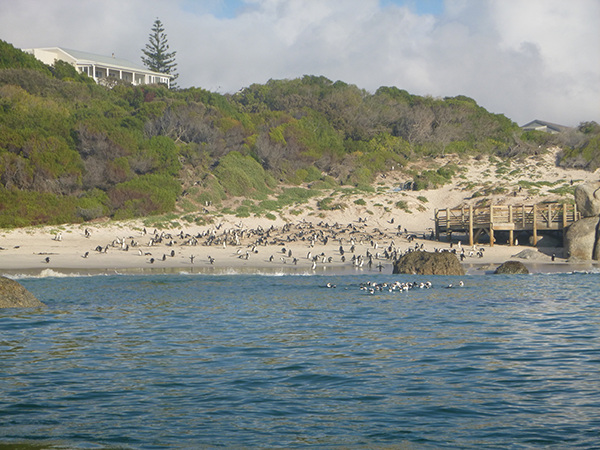 Fingers crossed that we row by the penguin colony at Boulder Beach. It is fantastic to see these beautiful creatures from the water. We will sight see in the afternoon, exploring the spectacular Kirstenbosch Gardens. Sleep Cape Town. 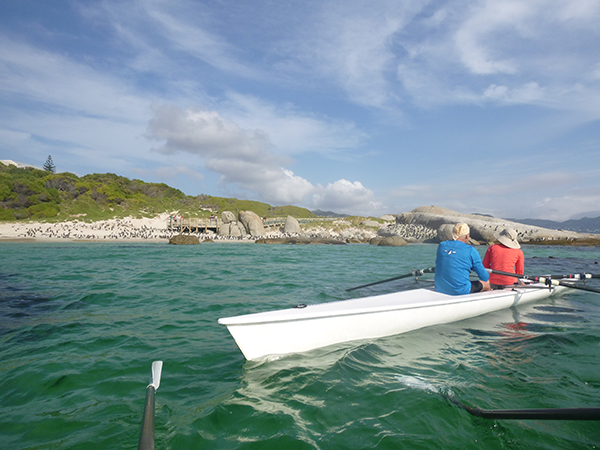 Another Cape Town morning row with Cape Coastal Rowing Club on False Bay from Simons Town or alternate location depending on conditions. If we were not able to see the penguins yesterday, we have a second chance. But the scenery is magnificent from any perspective, with Table Mountain towering above the bay. We will continue south to visit to the Cape Point National Park (Cape of Good Hope), returning to the hotel in the evening for a final dinner in Cape Town. We will start heading east, beginning with a drive to the beautiful Eikenhof Reservoir. We will row with Elgin Rowing Club, perhaps stopping part way to enjoy a refreshing swim from a beach. Then on to a lunch and wine tasting at a nearby winery. 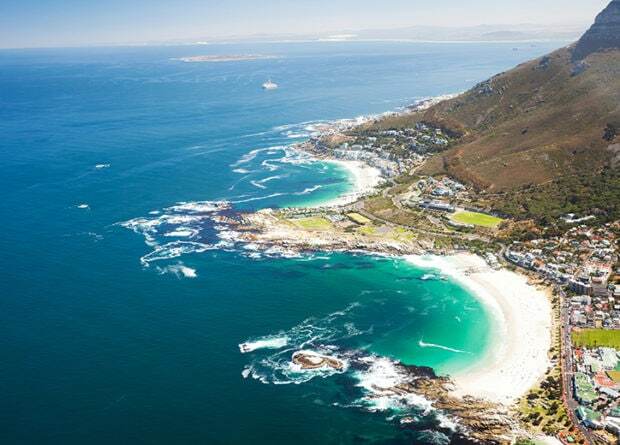 Our overnight will be in Hermanus, a coastal resort town famous for whale watching (but sadly it will not be the viewing season). Tonight’s dinner is not included in the trip price, with a wide choice of restaurants to select from. A relaxing morning before strolling along the Cliff Walk past the harbour, or a walk in a nature reserve or a swim at Voelklip Beach. After lunch, we will head to Stanford further along the coast. There we will our friends from Cape Coastal RC. After unloading the trailer and getting the boats ready we will enjoy an afternoon row on the winding Klein River. Overnight in a guesthouse in Stanford. Today we have a full day to explore the Klein. Perhaps down to where the river meets the ocean or we could row upriver towards the vineyards and hills. Tiny sharks are known to enter the river here, but not to worry – swimming is still safe. Stanford is located in a fertile agricultural valley and we will find picnic supplies from the famous cheese shop supplemented perhaps with beverages from the brewery or nearby vineyards. Overnight in Stanford. We will load the trailer and then head off to explore a different river, the Breede. Far away from the tides, the narrower river winds through vineyards and fruit orchards, with the hills closer in. This is also wine country and we will be sure to sample the local wines. 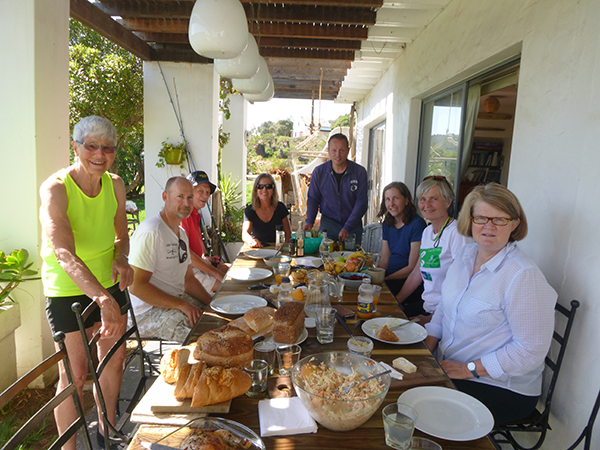 We say farewell to our friends from Cape Coastal before settling into our hotel in a vineyard for our farewell wonderful dinner. After many days of rowing, it will be a sad and fond farewell to the group.